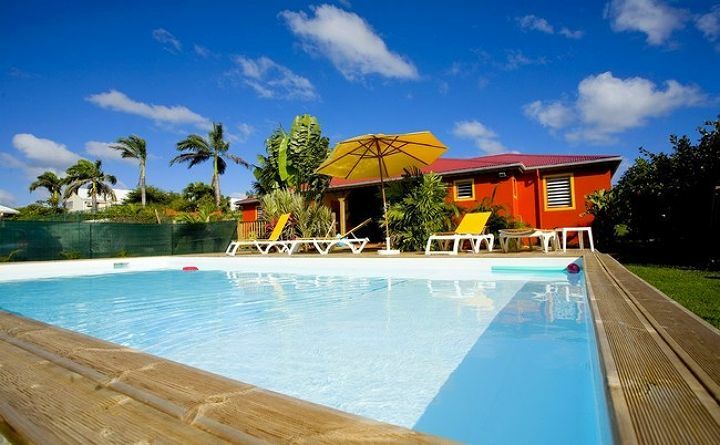 The cottage Sunset Surf Camp covers a tropical garden a few hundred meters from the beach of Raisins Clairs and 10 minutes walk from the center of Saint Francis. Its location offers a holiday in quiet surroundings close to sports (surfing, kite surfing, diving, parachuting, golf, tennis, ...) but also tourism and trade St. Francis (shops, bars, casino, night club old port, marina, traditional market, tourist center ...). Your life surf camp will be organized around two major structured bungalows a large central living area and four bedrooms each. Jhon , Yhan and Sacha , national monitors club Scuba diving NOA welcome you to the Marina of St. Francis . Baptisms diving and CMAS , PADI CMASS or are in the beautiful lagoon of Saint Francis. Certified divers can explore the beautiful reefs in the south of Grande Terre , Pointe des Châteaux , Petite Terre and La Désirade . Alain and his team await you every morning for a day of unforgettable canyoning on the slopes of the Soufriere Hills Volcano . Program : discovery of the forest and its lush tropical vegetation, rappelling in streams and waterfalls, natural waterslides and jumps in the most beautiful waterfalls in the south of Basse Terre . Sensations and atmosphere ... guaranteed ! Trip in the neighboring islands of Petite Terre , Les Saintes, La Désirade , Marie Galante through maritime shuttle or boat sailing from Saint Francis. All the crew of the catamaran Awak wish you bie come. Small Cap on Earth for a perfect day in this natural reserve: a beautiful lagoon surrounded by two deserted islands. Program observations iguanas, coral reefs , sea turtles , rays , sharks lemon barbecue lunch on the beach in an ultra friendly atmosphere. Near the Marina, 5 minutes from downtown, the international golf of Saint Francis was designed by the famous American architect Robert Trent Jones , a superb 18-hole , 5990 meters, par 71 , with coconut trees and royal palm trees , punctuated by sandy bunkers and small ponds. Haras de Saint François offers horseback riding to discover the beauty of the coastline of the mainland , gallop guaranteed on beautiful deserted beaches ! Two large structured bungalows a large central space and four bedrooms each. Whether you come alone , with family or friends, eight large dormitory rooms are ready to welcome you , three beds each (one large double bed and a single bed ) , well appointed , decorated in Caribbean style . These beds can be completed either by an additional folding bed or a cot parachute . Each room has a large bathroom with sink and shower and a separate toilet . The rooms are equipped with powerful ceiling fans and each bed has a mosquito net. A portable air conditioner can also be supplied on request. This is usually in the bungalow that stand the evening entertainment. The central space of the other bungalow has corners rest and parties living space sound and video and free Internet access . Whether you come alone , with family or friends, eight large dormitory rooms are ready to welcome you , three beds each, well appointed, decorated in Caribbean style and ventilated by a powerful fan . The central space of the first bungalow is reserved for the reception, bar and restaurant area for breakfast and lunch. We also offer at the request of hearty breakfasts and two guest tables per week, the menu of delicious preparations of local vegetables and fresh fish of the day. A common fully equipped kitchen is at your disposal if we will recommend nice restaurants of St. Francis. To start surfing nothing like a quiet wave in water at 28 ° C, suitable equipment and especially the advice of a monitor patented state surfing. Sunset Surf Camp offers all this in the form of internships thanks to formulas "all included" the day or half day. Olivier our surf instructor will take you to Sunset Surf Camp and take you to the most suitable beach. The appointment took place at 9:30 in the morning and in the afternoon at 14:30 at Surf Camp. After more than twenty years ago on the waves of the island, with its surf Peyo taxi will take you to the spots that work best depending on wave conditions. Departure times: 9:30 am, 2:30 p.m. in the afternoon, unless the swell goes North and we went to the day for the great spots of Northern Grande Terre Port Louis or Anse Bertrand. Come (e) without surfboard or want to try another day according to weather conditions, the Sunset Surf Camp offers you to rent from a wide collection. Located on the main beach of Saint Francis, 5 minutes by bike, kite school offers programs for all. You are new to kitesurfing, after 1 or 2 courses in shallow water which you will discover the handling of the wing, your departure will be made by Zodiac to navigate safely at sea. Already competent kitesurfing, your courses will take place behind the reef, the start will take place semi-rigid zodiac 5 meters equipped with an engine of 60 hp. Your course will last three hours, from 9:00 in the morning and 14:00 in the afternoon. At your request we organize trips to Désirade at Petite Terre and in the Grand Cul de Sac Marin when the conditions are met for optimum surfing. Our Internet station will let you know every morning wind conditions and swell the best choice spot of the day. The Gwada and in particular the Grande Terre is full of surf , the geographical situation of Guadeloupe , as well as its orientation allows it to receive swells North West, North, East and South. Surf breaks of Northern Grande Terre , Port Louis and Anse Bertrand operate as regularly from December to April , when swells West at North East generated by cold fronts in the North Atlantic lapping our shores . The surf East to mold and on the north coast of Pointe des Chateaux operate all year round , but with better consistency from September to November , when the cyclonic depressions send their powerful swells from December to April with North swells . They also often benefit from August to November swells South raised by tropical depressions that cross off the island. Sunset Surf Camp is a 5 minute walk from the lovely long straight and regular old port of St. Francis , it is perfect for beginners. The spot of the handle to the boat in 5 minutes by bike su surf camp is a hollow wave suited to intermediate level surfers . Séjour au top, un grand merci à Babeth et Peyo pour leur accueil et la convivialité de leur surfcamp, et à Jzulion et Olivier! Ambiance cool, tables d'hôtes à ne pas manquer pour la qualité des repas et les rencontres et échanges avec les autres. Tout est réuni pour des vacances exceptionnelles! Le camp est très bien situé, mais une voiture est tout de même indispensable pour visiter l'île et aller sur les spots de surf. On y reviendra!!! !